Each player is an Italian prince and begins the game with two cities. During the game, each playerrquote s goal is to increase the size of the territory he controls by expanding his starting cities and establishing and growing new ones. The players must manage food for their people, as well as health, culture, and education. The player who best manages these things, will win the game. Like Princes of Florence? You'll probably like La Citta. Like PoF, each turn builds on what you chose to do before, but you must be more conscious of what your neighbors are doing. Very engaging game for the whole 2 hours, and the scores are usually very close. This is one of our favorite games. It fulfills our craving for a city-builder, without the typical time investment. 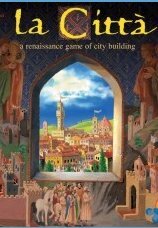 La Citta will appeal to anyone who enjoys the civilization building genre but doesn't want to spend 6 hours doing so. It plays in about 90 minutes but still provides a rich experience. Interestingly, instead of rival cities fighting they lure citizens away by having more culture. It's an interesting mechanic. If you like growing and managing a city you'll probably like this game. Enjoy!